[XP] Unexpected file format, and unable to create file? Ive been working on a game for a few months now and the last time i opened it there was a problem it said "Unexpected file format." so i tried opening the application and it had no problem (i know that doesn't change much). Then i tried making a new project but instead of creating it, it said "Failed to create folder." 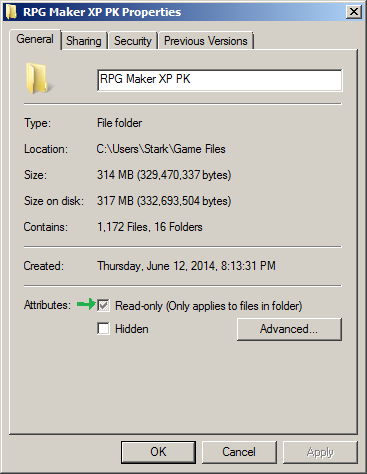 so i reinstalled rpg maker xp an still couldn't open or create a project and so i tried three more times (by uninstalling then trying again) and still didn't work. I would love some help, and thank you. Edit: Sorry if i have bad punctuation and or gramer. What OS, what version of RMXP? Have you changed absolutely anything about your computer lately? Have you scanned your computer for malware and viruses lately? What's your favorite food? How do you plan to pay for this premium support service? I remember this happening to me randomly. Don't worry, just copy the data folder into a new project and if it opens normally then transfer the other files. If it errors again, copy the data files one at a time in a new project until you find the one causing the problem. Make sure that the folder for RMXP isn't read only for some reason. No its not on read only, thanks tho.